While walking down a street, close to Lake Atitlan, Guatemala, I spotted this vendor selling eggs. I was so drawn to her that I back tracked with my camera and asked, “permisso?” She looked me sternly in the eye and said, “You pay?” I held money out to her, and she took it, smiling as she settled herself for a picture. The egg she was holding glowed in the sun. 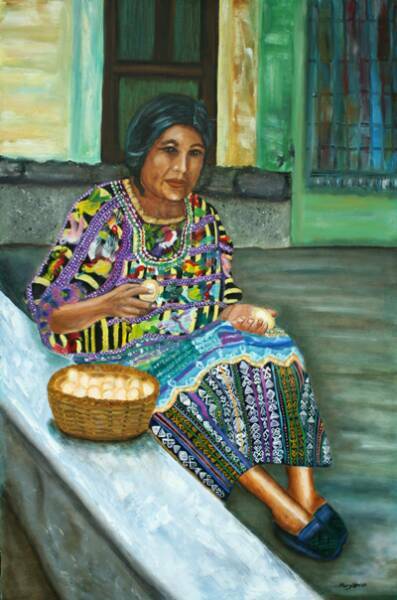 The brightly colored weaving she was wearing completed a feeling of connection to both earth and creation. The moment held, the camera clicked, and a vision was captured. All for the price of a photo!